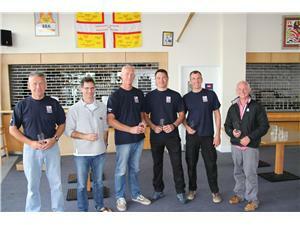 For the first time since 2007, the Royal Navy are the Inter-Services Windsurfing Team Champions. The event, held at the Weymouth and Portland National Sailing Academy last week, saw two days of Formula course racing in tough conditions which the RN team dominated. There was some close and exciting racing with 5 sailors from the 6 man team finishing in the top 8 of 23 competitors, with equipment failure ruling Windsurfing Rear Commodore Nic Dodd out of the final 2 races and finishing a still respectable 13th. Having returned to the RN, WO Dave Strudwick showed his experience as Team Captain and ensured the squad were well prepared and competetive. The team had great depth of experience, but particularly impressive was AB ET(ME) Tom Eskdale who won 4 of the 7 races and was crowned Inter-Services and Royal Navy Champion. The other team members were: Capt Adrian Wallis, Cdr Nic Dodd, Lt Cdr Paul Morris and CPO Johnny Walker, with Cdr Tom Joyce in reserve. You can follow the team on their Facebook page at the link, just ask to join.